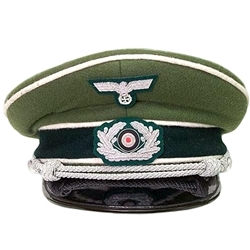 This German Army Officer’s Cap WWII Reproduction is a fine German Army (Heer) reproduction visor cap that is perfect for the 2nd world war re-enactor or collector. This Army Officer’s Cap is grey green in color, complete with infantry white piping, silver cap cords, silver colored cloth cap badge and a silver colored eagle badge. Patent leather visor and leather sweat band.